THE ORCHID hotel is located near Mumbai. It is one of the best eco-friendly hotels in Asia. It has won 77 international awards for making so many efforts for being a pioneer among eco-friendly hotels. The Facade – the building is constructed with many depressions and protrusions so that majority of dead walls remain under shadow which will reduce surface radiation. QED – the interior walls are constructed using fertilizer waste instead of red bricks by conserving the topsoil of the earth. Aerators/Flow restrictors – the water taps are attached with aerators which will increase the water force but reduce water flow. The taps also have timers. Cisterns and Flushes – Geberit Concealed cistern is employed which will reduce 10-15 litres of water per flush and Geberit Urinal Flush Valve’s infra red detector is used to prevent unwanted flushing of timer set systems. Sewage treatment plant – this plant is used to treat wastewater which is reused for air conditioning and gardening. Rubber wood – normally rubber trees and cotton tress are cut down and are useless after production as their woods are soft. 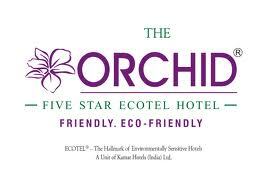 But in the Orchid hotel these woods are upgraded and used as a substitute for natural wood. Reused wood – the woods from the old buildings had been recycled and used for the woodwork in their South of Vindhyas restaurant. Triple glazed windows – these windows blocks the heat of the sun entering the room which in turn reduces the use of air-conditioning energy. PL lamps/fluorescent tubes – these lamps are employed to reduce power consumption by 25%. Air-conditioning – the Orchid hotel uses R22 refrigerants instead of CFC for air conditioning which reduces 99.55% ozone depletion. Air scrubber for boiler – scrubber are employed in the boiler smoke outlets. In these scrubbers water is sprayed so that the carbon dioxide in the fumes will get dissolved and settles while the water used for spraying is recycled water. Zero garbage – vermiculture has been employed by using nine bins to dispose kitchen wastes.